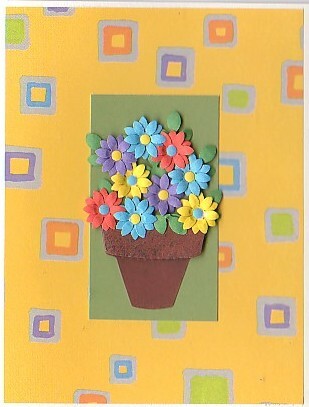 The pretty bouquet on this card is bound to brighten someone's day. For the flowers on this card, I used card stock in colors that coordinate with the squares on the background paper. I used an embossing tool on the flower petals to give them dimension and stacked them, offsetting the layers. I also used an embossing tool on the backs of the flower centers and the leaves. I cut an extra flower pot top and mounted it with foam squares to add dimension to the flower pot.